Going into their game against the Mets last night (as I wrote this), the Brewers had a 7.5-game lead on the Reds. Now, one can't really hope for a sweep. But can you imagine? That'd suddenly put the Reds 4.5 games back. With the Cardinals still hovering around 0.500, the Reds have an opportunity here. I like the Reds pitching match-ups in all three games. If the offense can build on what it did the last two games of the Dodger series, this could be an exciting weekend for the Reds. Here's to optimism! Go Reds! 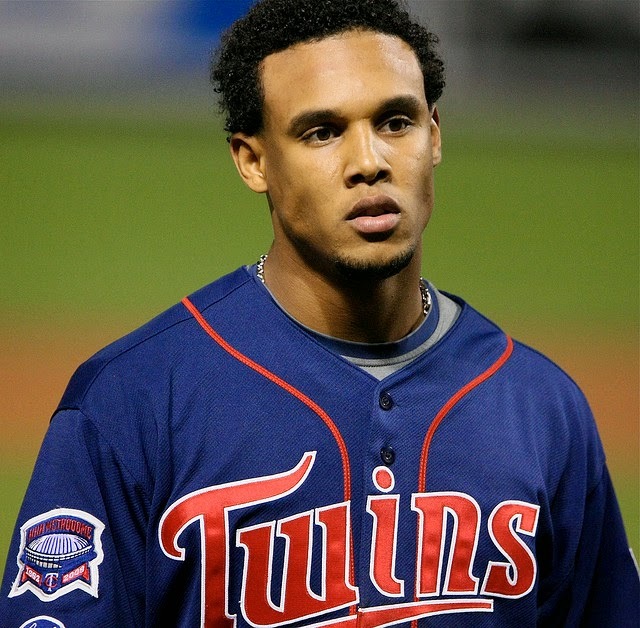 I also wrote a bit about Carlos Gomez. He fits into the mold of a former top prospect who had been given up on by nearly everyone, only to discover himself. Others include Jose Bautista and Edwin Encarnacion, although to his credit, Gomez was never DFA'd. Some of Lucroy's best competition in the MVP race is his center fielder, Carlos Gomez. I think Gomez is fascinating. I find it almost impossible to believe that he's only in his age-28 season, because it seems like he's been around forever. He was the key acquisition in the Twins' deal that sent Johan Santana to the Mets before the 2008 season. Despite playing in the majors as a 22-year old, he was largely considered a flop in the aftermath of that trade. He earned a strong reputation as a great defensive center fielder, but he didn't hit a lick. The Brewers acquired him in exchange for J.J. Hardy, a deal that many (myself probably included) panned. Hardy was often-injured, but he was a quality offensive shortstop coming off a bad season, while Carlos seemed like the definitive no-hit defensive center fielder. Then, something happened in the second half of 2012: Gomez started to hit for power. From July through September, Gomez slugged 15 home runs (previous season high was 8). He continued to show that power through last all of last season, and FanGraphs estimated his season value at 7.6 fWAR (though that might be a bit inflated by a +24 run fielding rating...though b-ref gave him +38 runs in the field and 8.9 WAR, so....). He's one of the best players in baseball. This is the kind of thing that has taken me forever to wrap my head around. I am a projection guy, and rely on them to guide my evaluations of players to avoid getting overly excited about new changes in performance. In fact, MGL just wrote a great piece on the importance of this approach, which was then summarized by Dave Cameron. But there are guys for whom I am bound to miss with this approach, and Carlos Gomez (and Bautista and Encarnacion) are cases in point. Therefore, while I use projections, I also try to keep an eye out for toolsy guys who seem to finally be figuring it out. In my view, the lesson is to trust your projection tools, but to still be cautiously conservative in their ability to forecast the future. I'll always have a blind spot for this kind of player, but hopefully I'm not as blind as I once was. Previously a highly-touted prospect out of the Montreal farm system, this guy is apparently going to sit on our bench this year. He is out of options, and the Reds seem to have acquired him from the Indians because they didn't want to lose him via waivers and he's not good enough to be on their team. Phillips had a very good half-year as a 21-year old in the then-Expos' AA franchise, hitting 0.327/0.380/0.506/0.886 in 245 at bats in '02. But that's the last time he had a really outstanding, prospect-like season. He was probably rushed a bit to the majors in '03, but was thoroughly ineffective there and hasn't done a whole lot since. His '04 campaign with the Indians' AAA affiliate was decent (0.353 OBP), but he regressed a bit in '05. Krivsky mentioned in his rain delay interview with Marty Brennaman today that Phillips hit 15 homers last year in AAA, which is good. But his slugging percentage was a fairly poor 0.409, particularly given those HR totals. Overall...I wouldn't expect much from this guy's bat this season, and perhaps not ever. Phillips might be overrated by some of the Cincinnati media, but there's no question that I missed the mark badly on this one. Phillips has posted five seasons as an above-average hitter during his time with the Reds, has played legitimate gold-glove defense, and has topped 3 WAR five times (and posted 2.9 fWAR a sixth time). He's been an excellent player for the Reds since almost the first day he donned the Reds' uniform. The scouts were right. Jesse Winker: a near-future answer in left field? What ex-Ballplayer Was Born at Sea?